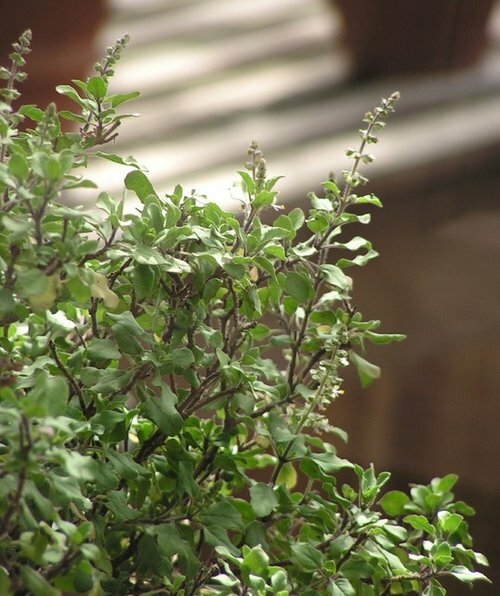 Tulsi or Holy Basil is a sacred herb that is worshiped in India. Almost all houses in India have this plant and it has a lot of medicinal and healing properties. It purifiers the atmosphere and is an essential ingredient in many of the ayurvedic medicines. Its leaves stem and the roots are used for various purposes. Tulsi is also known as basil in English. Applying the paste of tulsi can cure various skin diseases and also cure ringworms. Tulsi may be eaten as it is or a paste of it is applied on the face to get rid of pimples and acne. A toner made by boiling its leaves in water removes pimples as well as provides a glow to your face. A paste made of tulsi and besan helps in lightening the scar marks. Tulsi is rich in antioxidants and also is a good moisturizer. So it helps in making you look fresh and young. Boil mustard oil with tulsi leaves till the oil becomes black. Cool it, strain it and apply on your body in winter. This is good for our skin and has great healing power. Dry tulsi leaves in the shade and then grind it with alum, sieve it and keep this powder in a bottle. This is excellent for healing wounds and cuts. Make a paste of tulsi leaves and add the white of an egg to it. Apply this on your face and wash off after 20 minutes. This will tighten the pores and also helps in preventing infections which may cause pimples and acne. Applying a paste of tulsi on the scalp helps in keeping the scalp cool and reduces itching and other discomforts. It also makes your hair healthy and free from any infections. If you massage your scalp with tulsi oil, your hair will be energized. It also keeps you energetic with its rich aroma and medicinal properties. Add a little of tulsi oil to the oil that you use on your hair and massage your scalp well. This will increase the blood circulation in the scalp and increases hair growth. You can remove dirt and grease from your scalp and hair by applying a paste of tulsi on your scalp and thus prevent dandruff. The anti-carcinogenic property of basil leaves help in treating various cancers including breast cancer. It can reduce the risk of oral cancer in those who use tobacco. If you are suffering from cough and fever, chew the leaves of this herb and you will get relief. A decoction made of tulsi leaves, ginger and honey is very effective for bronchitis, asthma, cold and influenza. If you have sore throat drink water boiled with tulsi leaves. You may also gargle with this water. This will provide you relief from sore throat. This herb is also added in many of the syrups and expectorants used for curing cough. Tulsi juice is excellent for various problems of the children like cold, cough, vomiting and diarrhea. You can prevent chicken box in children by giving them the juice of tulsi with honey. Tulsi juice is also good for giving children relief from cough and cold. Warm tulsi juice is very effective in removing worms from the stomach. Basil juice is excellent for the eyes and gets you relief from night blindness, conjunctivitis, boils and stress. The leaves of tulsi are used for curing various types of fever. You can treat malaria and dengue fever by boiling tulsi with water and consuming this at regular intervals. If a person is suffering from acute fever, boil tulsi leaves with cardamom powder in half liter of water to which sugar and milk is added. This helps in bringing down the temperature of the body. Tulsi also protects you from various infections because of its germicidal properties. Tulsi is beneficial for lowering the cholesterol levels in the body and is also good for preventing cardiac diseases and treating the weakness of the body due to heart problems. It protects the heart form the harmful actions of the free radicals because of the presence of Eugenol in it. Moreover, tulsi leaves help in lowering the blood pressure and therefore beneficial for the heart patients. Keep a few leaves of tulsi in your pocket and munch it whenever you feel like smoking. This will help you get rid of the habit of smoking and the juice helps in curing all the damages that have occurred due to smoking. If the juice of tulsi or a paste made out of its leaves and roots is applied on the skin where an insect has bitten, you will get relief from the pain. If any poison has entered such as in scorpion sting, the poison is fully removed by applying this paste at regular intervals. Tulsi leaves have detoxifying properties that help in lowering the level of uric acid in the kidney, which is one of the major reasons for the formation of kidney stones. So, if you consume the juice of tulsi leaves mixed with honey, you can get rid of kidney stones, which will go through the urinary tract. Tulsi is rich in Vitamin C, Eugenol and camphene, which are ideal for removing congestion forms in the lungs and for repairing the damages formed due to smoking as well as tuberculosis. Tulsi leaves are good for treating various problems of the stomach like constipation, acidity, flatulence, vomiting and loss of appetite. You can also get relief from stress by consuming the juice of tulsi regularly as it soothes the nerves and make you calm and relaxed.